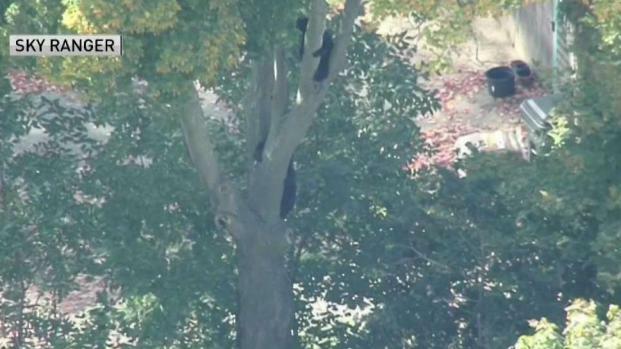 Two black bears had to be taken down from a tree in a busy neighborhood in Amesbury, Mass. on Tuesday. 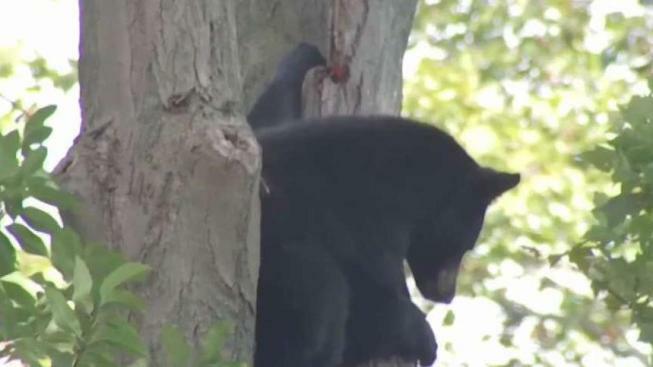 Authorities in Amesbury, Massachusetts, managed to remove a black bear and her cub from a tree in a residential neighborhood after they got stuck there Tuesday morning. The wildlife rescue took place on Elm Street, across the street from Mount Prospect Cemetery. NBC10 Boston's Sky Ranger caught the moment the adult bear dropped from a tree in the neighborhood and into a tan blanket below, with wildlife experts attending to the wild animal immediately after. After being hit with a tranquilizer dart by wildlife officials, the bear cub dropped from the tree and into another tan blanket shortly after noon. Wildlife officials say they had to tranquilize the animals to safely get them out of the Amesbury, Massachusetts, neighborhood. It took nearly six hours for environmental police to resort to tranquilizing the bears, after which each animal was tagged and released into the wild. Residents living near Atlantic Avenue and Elm Street were asked to avoid the area as local and state environmental police worked to rescue the bears. "It's the best and safest option for both the bears and the residents," Amesbury fire officials said on Facebook. The request from wildlife officials and first responders wasn't heeded by all, as the rescue efforts drew a huge crowd of people who were watching and hoping for the best.